New Year is one of the biggest celebrations we are looking forward every year. The time families and friends sit together whilst enjoying a sumptuous meal and a booze in hand. That said, many lives are lost whenever big even such as New Year happens because most people are drunk. Although I am not saying that all accidents and whatnot are caused by drunk driving, it is indeed one one of the biggest reasons. Here’s a post from The Nation. There was no mention of the word “drunk” or “booze” but I am confident drunk driving played a big role. 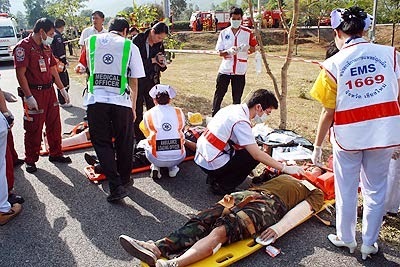 BANGKOK: — The first two days of the so-called seven dangerous New Year holidays saw 1,133 road accidents occur, 128 people killed and 1,158 others injured, the Road Safety Center announced Thursday. On the second day of the road accident monitoring period on New Year Eve, 625 road accidents happened, killing 70 people and injuring 641 others, the center announced.